This color-enhanced image of Jupiter and two of its largest moons -- Io and Europa -- was captured by NASA's Juno spacecraft as it performed its eighth flyby of the gas giant planet. The image was taken on Sept. 1, 2017 at 3:14 p.m. PDT (6:14 p.m. EDT). At the time the image was taken, the spacecraft was about 17,098 miles (27,516 kilometers) from the tops of the clouds of the planet at a latitude of minus 49.372 degrees. Closer to the planet, the Galilean moon of Io can be seen at an altitude of 298,880 miles (481,000 kilometers) and at a spatial scale of 201 miles (324 kilometers) per pixel. 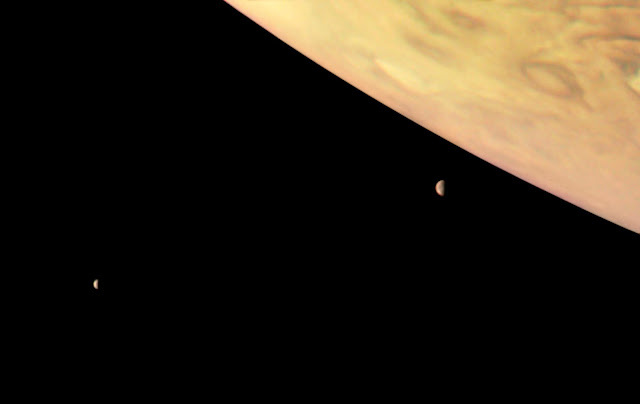 In the distance (to the left), another one of Jupiter's Galilean moons, Europa, is visible at an altitude of 453,601 miles (730,000 kilometers) and at a spatial scale of 305 miles (492 kilometers) per pixel.